Max Immelmann was born in Germany in 1890. He joined the German Army Air Service in November 1914 and served under Oswald Boelcke. In August, 1915, Immelmann won the Iron Cross: First Class, after a bombing raid on a Royal Flying Corps aerodrome. Immelmann was the inventor of the 'Immelmann Turn', a simultaneous loop and roll that became a standard dogfight manoeuvre. On 12th January 1916, Immelmann was awarded the Orsre Pour le Merite (Blue Max), Prussia's highest award for bravery. By June 1916 Immelmann had achieved fifteen victories. Soon afterwards he was killed during a dogfight with the pilot of a FE.2b. The British credited the pilot with the kill but the Germans argued that Immelmann's Fokker E malfunctioned and he shot his own propeller off during the battle. (1) The Frankfurter Zeitung newspaper reported the death of Max Immelmann on 24th June 1916. On 18th June, 1916, Max Immelmann met his death for his country in an aerial combat. Holder of the Iron Cross his glory and his name are his country's. 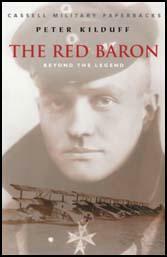 In the annals of the German Flying Corps his memory will live as that of a bold flyer, fighter and conqueror.